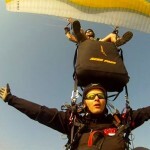 We are a team of paragliding professionals from Brasov Romania specialized in training and paragliding tandem flights. We operate since 2006 without any incident, we love what we do and want to share with others the joy of paragliding. Our goal is to provide a unique experience in absolute safely. And because the most important thing is safety and comfort of our passengers, we work with a team of experienced pilots and instructors, with who you will discover unforgettable feeling of paragliding, and admire the beautiful scenery. All our pilots are experienced in flight tandem and are licensed to “Free Flight Association in Romania. The equipment that we use are the latest and are certified DHV / LTF / EN. Because we combined our passion with many years of training and experience, we gained an exquisite technique that allows us to offer excellent services. Your paragliding center in Romania Brasov, the best flying site in Brasov. Learn to fly and enjoy a fantastic paragliding adventure with us. We provide the best paragliding lessons to begin flying, tandem flights for those who want to fly for the first time and professional services with qualified instructors.